WHEN I was a boy growing up on a farm in Gippsland, the horrific images of children starving during the famine in Ethiopia became burnt into my memory. More than 400,000 people died in that crisis in northern Ethiopia alone. Living in a place of relative abundance, I couldn’t understand how the world could let things get so dire; how children could go without food. For many people, the word “famine” may itself seem a bit 1980s. Yet, almost three years since the United Nations declared famine and the world mobilised in East Africa, the spectre of mass hunger, starvation and death stalks the world’s youngest nation — South Sudan. 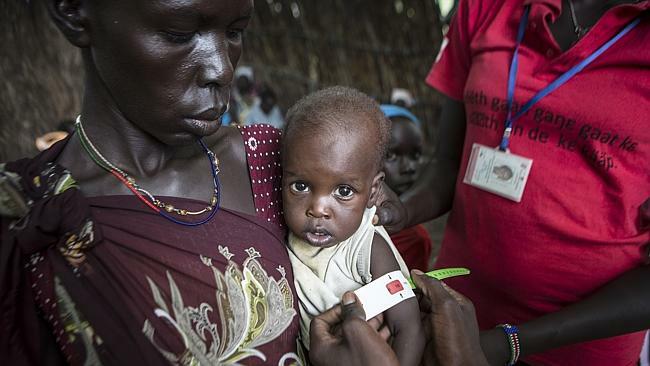 South Sudan’s President Salva Kiir has joined the UN in warning that the growing humanitarian crisis is on the brink of becoming a full-blown famine. Food prices have skyrocketed because of fighting and predictions of a lean season ahead, with children being hit hardest. At present, 2.5 million children across South Sudan face immediate food insecurity, struggling without the basic means to survive. In many parts of the country children have been attacked and killed. Schools and hospitals have come under fire and thousands of families have fled their homes, ending up scattered across camps and in the bush. Nyapuoch, a mother of two, walked for days to get to one of Save the Children’s five feeding clinics in the village of Akobo in Jonglei state. She told our staff she had no choice but to feed her children potentially poisonous wild berries along the way to keep them alive. More and more families are finding themselves in a similar situation, forced to forage for flower buds, leaves and wild fruits because they can’t afford to buy food. Children are dying from malnutrition, while the frequency of malaria is likely to rise as the rains intensify. And at the heart of South Sudan’s problems is the ongoing conflict, which threatens to break out into full-scale war. Recently a semblance of hope was restored following the signing of a peace agreement by President Kiir and rebel leader Riek Machar. But it took only hours for fighting to reignite after the ceasefire pact came into effect. Unsurprisingly, both sides blamed each other. At the same time, almost 400 cases of cholera have been identified. The timing could not be worse. With the rainy season under way, many of South Sudan’s communities face flooding and poor hygiene conditions, a situation that is a perfect storm for a deadly epidemic. Those who have been displaced from their homes, especially the children, are particularly at risk. Compounding those problems, the rains have already started making travel difficult. Soon many roads will become impassable, meaning aid agencies will struggle to deliver lifesaving food supplies and malnutrition treatment. THE question is: What can be done to prevent the current food crisis blowing out into famine in South Sudan, a nation not yet three years old? There are two things that need to happen. First, the violence needs to stop at least long enough to enable full humanitarian access to the worst-affected areas, including Jonglei, Unity and Upper Nile states. The peace agreement signed on May 10 was a dismal failure. The parties must adhere to the peace agreements they have signed, as well as their Recommitment to Humanitarian Matters Agreement. With the plight of South Sudan increasingly featuring on evening news bulletins around the globe, the international community must use its collective eye to keep the pressure on South Sudan’s leaders. Second, the UN’s $1.8 billion appeal must be fully funded. In Norway last week, a meeting of more than 40 countries and 50 organisations pledged more than $600 million to pay for food and healthcare in South Sudan over the coming year, although the figure fell short of what was hoped for. The international community must dig deeper into its pockets. The Australian Government bolstered its contribution by $2.6 million, taking its total humanitarian assistance for South Sudan to $13.4 million since fighting began in December 2013. It is an important step in the right direction — however, the famine in East Africa three years ago should serve as a critical lesson: decisive action needs to take place early. Six months after the worst of that crisis was over, leading aid agencies published a report that showed thousands more lives and millions of dollars could have been saved if the international community had taken decisive action on early warnings of a hunger crisis in East Africa. Our window of opportunity to avert a fully blown famine in South Sudan is closing fast and the time for the international community to act is now. To donate to Save the Children’s Emergency Fund, go to www.savethechildren.org.au or call 1800 76 00 11.